"?" 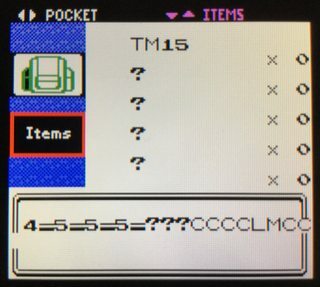 (hex:00) crashes English Crystal when forced into the Bag and the player accesses it, while it loads fine in Japanese Crystal, where it has a garbled and meaningless description too. Can anyone reproduce this or is it just me? I'm using BGB 1.5.1. The codes for English Crystal are already on the wiki. The pointer table of item descriptions is at $02C02D in Japanese Crystal or $1C8987 in English Crystal. 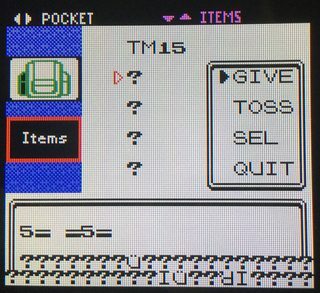 In Gold and Silver, this table had 256 entries, giving a dummy description for every glitch item, but for some reason in Crystal it only has 255 entries, so the pointer to item $00’s description is taken from the first two bytes after the end of the table, which is the first two characters of the text for the Master Ball’s description. Tested with English version on console (using 91 versions of codes, not 01). It crashes basically the same way it does on BGB. Note that unlike BGB, on-console it did the normal reset and then "HEY YOU NEED A CGB" screen. This causes a crash, but only once I scroll down. It first it writes a bunch of stuff to the text box, then does the low-hp sound, and then does the CGB screen crash. It's much easier to test this when walking out of bounds at the start of the game, since you happen to get a ?. Changing 05 in line 4 of the second code changes the Master Ball's value; 55 gives you 85 of 'em. You can get rid of the "?" item by changing the 00 in line 3 to a different value, but I don't imagine that's the point. Line 1 really fucks up your scrolling, though, since the cursor won't go past the 2nd item; changing it to a value greater than what's currently in your ITEMS pocket will let you keep scrolling down, until it starts showing information from the KEY ITEMS area. This batch of information you probably already know was brought to you by SCIENCE! @Háčky, thanks for the explanation. I guess this also would explain the differences in the descriptions of HM08-10 and 12 between Gold/Silver and Crystal, which according to Bulbapedia, changed from "?" 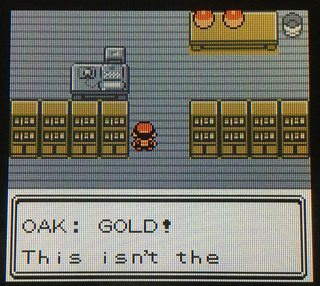 in Gold/Silver to the descriptions of other moves in Crystal. @pokechu22, how far did you scroll down? Did you end the list using 01FFxxD8? I scrolled down only one, and then the game froze when it attempted to load 00h's description. I didn't terminate the list (though I probably should have). Probably wouldn't make a difference though, since my goal was only to test what happen when viewing 00h's description. Well, if you don't terminate the list, it'll always crash after you scroll down to a position without a valid item, regardless of the item in question (this is my experience in BGB). But yes, it doesn't change in 00h's case. Oh, I see. That means HM08-HM10 are similar to the Badge items of the Generation I games (which are used on the list shown by the man in Cerulean IIRC), correct? ld [hli], a ; set item quantities to data from $A793 et seq. I used the following GameShark codes to put TM15 in my Items pocket and write the code to $DA10, where TM15 will execute it. (This is an unused area of WRAM between the end of the trainer rematch data and the start of the event flags. You can safely stash up to 98 bytes of code here.) Since external devices seem to affect how item $00’s description behaves, I saved the game, then removed the GameShark before executing my program. Anticlimactically, this program always reads fifty $FFs, regardless of whether it’s run in BGB, or on a GBC or GBA, or even with the GameShark plugged in. It seems there must be some difference between what happens when SRAM addresses are accessed through TM arbitrary code execution, and when they’re accessed to read the item description. 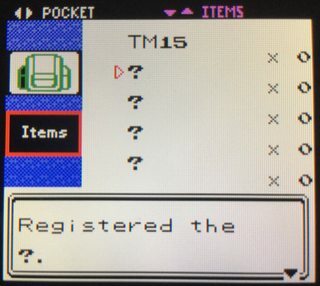 The game is clearly reading something that’s not all $FFs when it displays reams of glitch text on a GBA. If at first you don’t succeed…try calling a ROM function? Bits 0, 6, and 7 of these numbers vary, but bits 1–5 are the same: $2A. Opcode $2A is ld a, [hli], which happens to be the instruction used in the CopyBytes function I’ve called to read from disabled SRAM. It seems what’s happening is that the GBA reads the opcode from the cartridge ROM, executes it, tries to read a byte from the cartridge SRAM, and doesn’t get a response (because it’s disabled), but picks up a residual signal of the last byte sent on the data bus, which is the opcode. This explains why my last experiment didn’t show anything useful: my code was executed from WRAM, which isn’t in the cartridge, so there was no signal on the cartridge data lines and everything was read as $FF, even on a GBA. Since bits are apparently only flipped from 0 to 1, and not from 1 to 0, it is impossible for the item description to include the string terminator $50 (until it runs past the end of SRAM and into WRAM, but it’s bound to crash the game or hit an infinite loop of text commands before then). But it can—and inevitably will—include the text command $5A, which is supposed to display the name of the attacking Pokémon in battle. Based on the value of hBattleTurn ($FFE4), it prints either BattleMonNick ($C621), or “Enemy ” followed by EnemyMonNick ($C616). In many places, the description will overflow the tilemap buffer and trashes enough of WRAM to crash the game. In other places, it will contain a line or paragraph separator which allows the text to be paged through indefinitely. 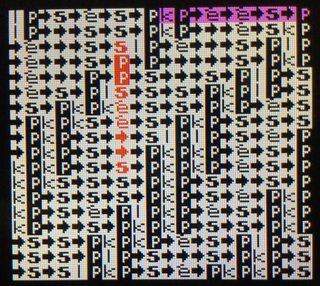 Unfortunately, this isn’t reliable, because the locations read by text command $5A are just past the end of the onscreen tilemap buffer ($C4A0–C607) where the description is being printed. If the description overflows the tilemap buffer, it can overwrite the $57 byte and prevent itself from being terminated. The game reads item $00’s description from $A793 while SRAM is disabled. The point of my experiments was to understand what happens when it does that, so, obviously, I didn’t enable SRAM.